No joke, I was singing that song the other morning and Joey responded with “If you keep singing like that, you will be!” Rude! Anyways, what this week’s CSA post title is actually referring to, is the fact that I did the pick up all by myself. I was half tempted to pull over on the side of the road to take a picture of the field of cows we always pass (because no one was there to stop me!) but decided walking around on the shoulder of a road with a high speed limit probably wasn’t such a good idea. 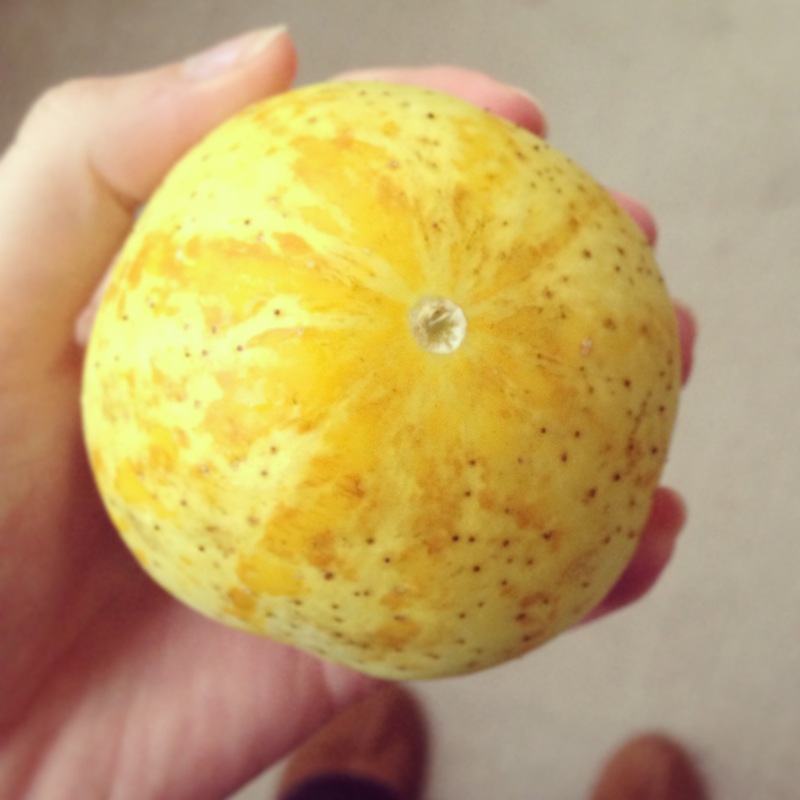 Lemon cucumbers are so cool looking, inside and out! They’re much more lime green than regular cucumbers and while the flavor is the same, they are way seedier! 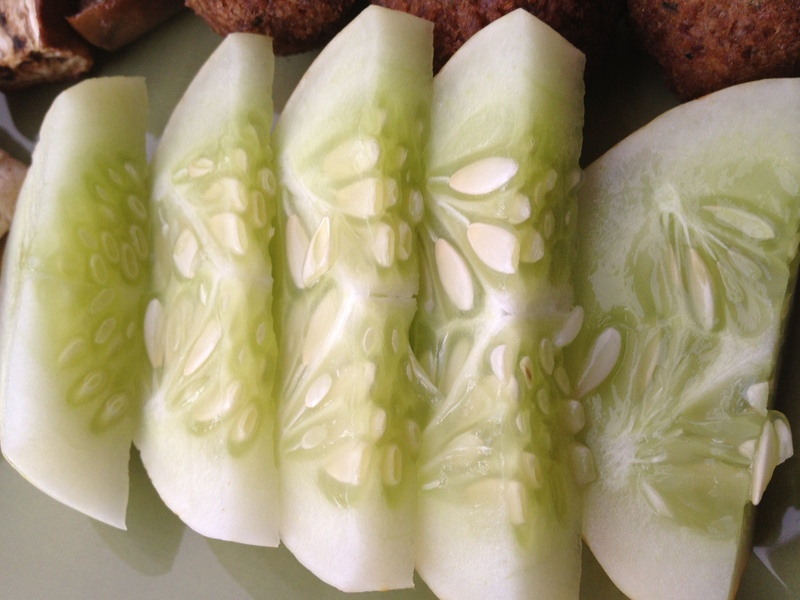 If the seedy part of the cucumber grosses you out, this isn’t the fruit for you. We loved them, however. I threw this plate — let’s call it a Greek Sampler — together on Wednesday night. 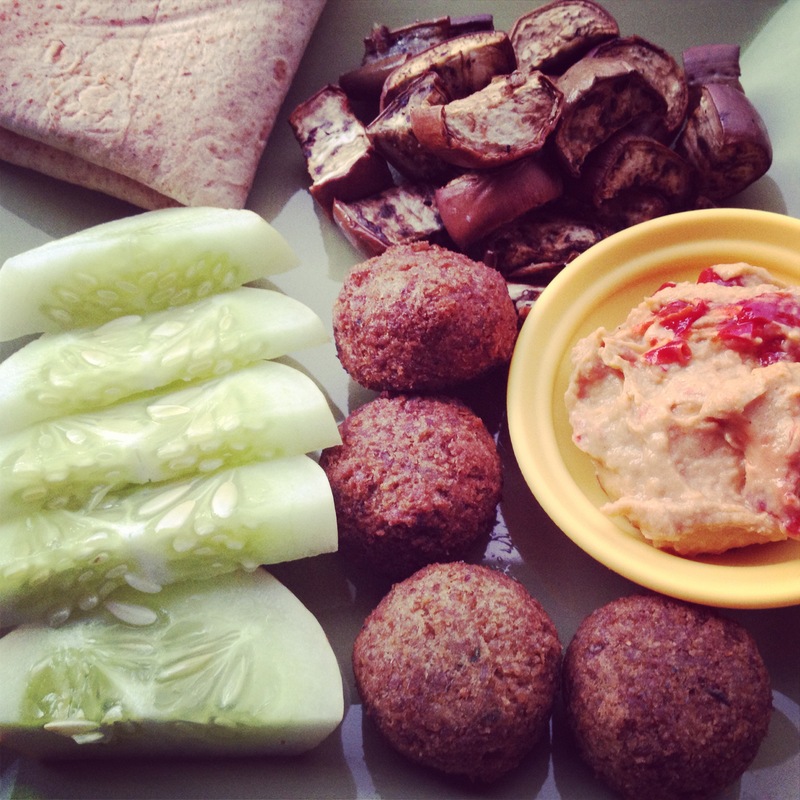 Except for the roasting of the eggplant and the heating of the pre-made falafel balls, this dinner was super speedy and hands-off, which was great because I was busy icing a red velvet cake for our realtor. What, that isn’t normal? Back to dinner. It turned out to be really fun and really delicious. Maybe the Greek Sampler should be a regular thing around here. Truth: I do not like cantaloup. This is very strange, considering there are very few foods I won’t eat, but I’m just not a fan. Joey, on the other hand, really likes cantaloup. We had a choice between the melon and cherry tomatoes (love!) but I decided to be a good girlfriend and go with the cantaloup. 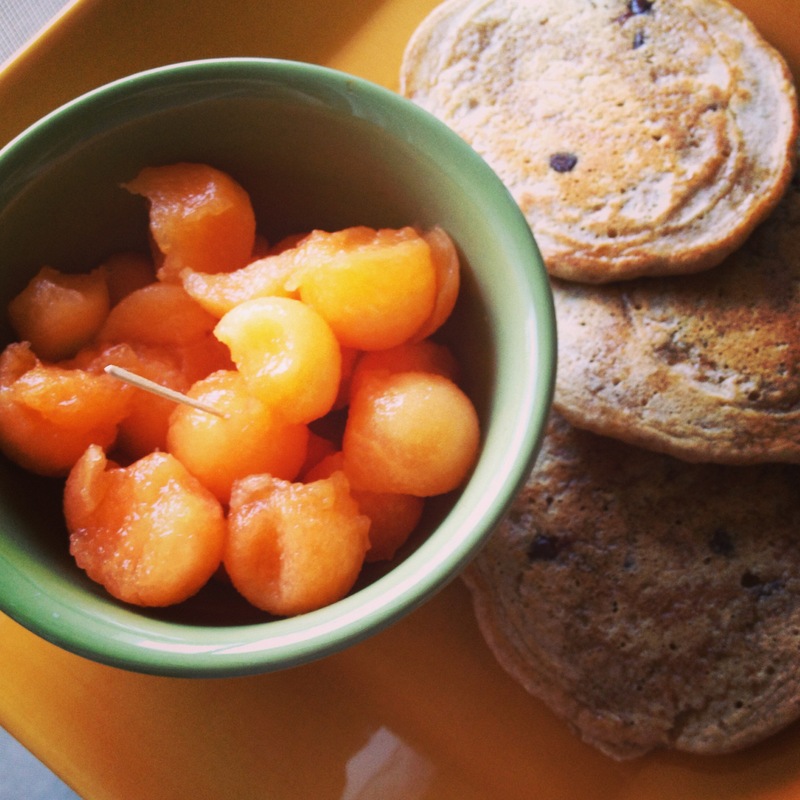 Joey used the melon baller and we had it alongside some Sunday morning pancakes. I think I ate about 10 melon balls, then decided “yeah, I still hate that stuff.” The pancakes though! The roasted chilies and purple potatoes both went into these chorizo tacos. Um how cool is it that the farm roasted chilies for us? I was pretty excited. Also, purple potatoes are just the coolest. I had the choice between fingerlings and purples. That choice is just so obvious isn’t it? 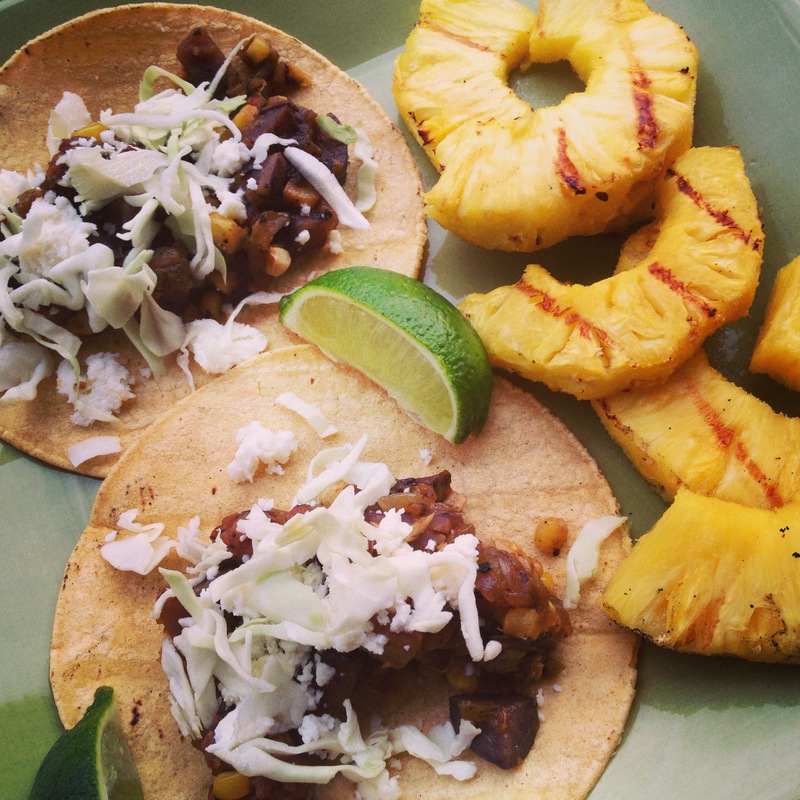 These tacos were amazing and pairing them was grilled pineapple is my subtle way of saying “I’m not ready for summer to end!” P.S. If you’re short on time, do not Google the spelling of chilies/chiles/chilis/chillis/etc. I just did and I still don’t know the real answer. Knowing we’d be out for dinner on Tuesday and Wednesday, I threw a big batch of “summer soup” in the crockpot on Sunday so we’d have leftovers during the week. 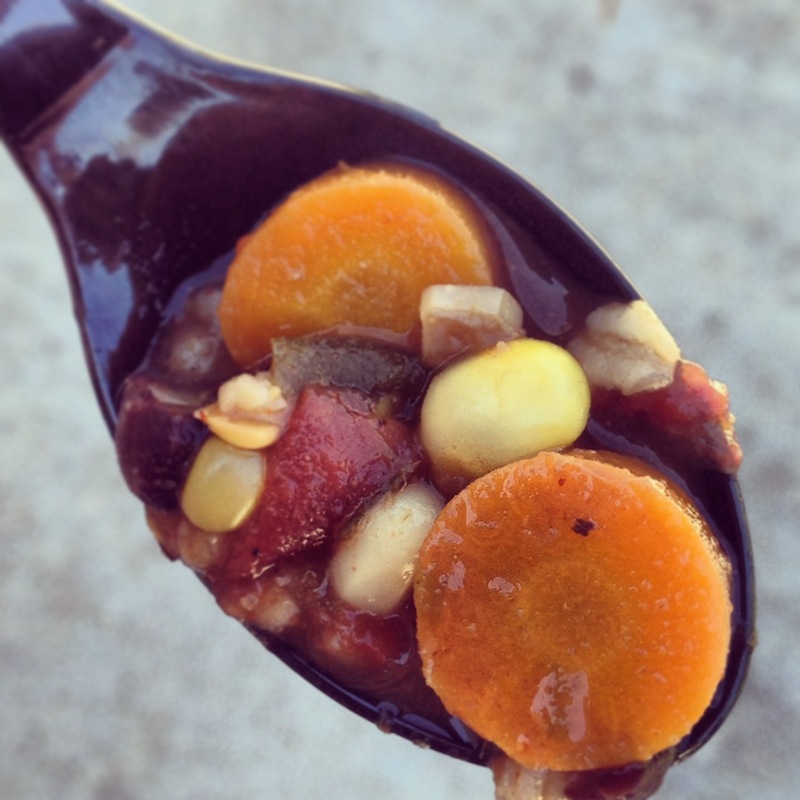 Yeah, summer soup is a thing. Actually, I’m just calling it that because it had fresh corn in it and because I’m not ready to talk about anything that follows summer. I mostly followed this recipe (which I happen to love) and was able to use up our carrots before they got to the flimsy stage. Aren’t you proud? Adding frozen okra to soup is the best. Side Note: Sorry to any readers that these CSA posts are all I seem to be able to pump out lately. I’m feeling “busy” and semi “uninspired” lately. Which really just means I can’t seem to think or talk about anything that’s not new house related. I also know this to be an extremely boring topic for others. I’ve tested this theory on my sister, so trust me, I know. Haha! Love that opening line! And I love the look of those tacos! I haven’t had any kind of potatoes in what seems like forever (totally with you on how cool the purple ones are…have you ever had a purple SWEET potato?)! Can’t say I’ve ever thought to add potatoes to tacos before…I’ve got to try that sometime! And definitely with some grilled pineapple! Yum! I’ve never heard of a lemon cucumber before! How neat! And good idea with the Greek sampler dinner! Love me some roasted eggplant!